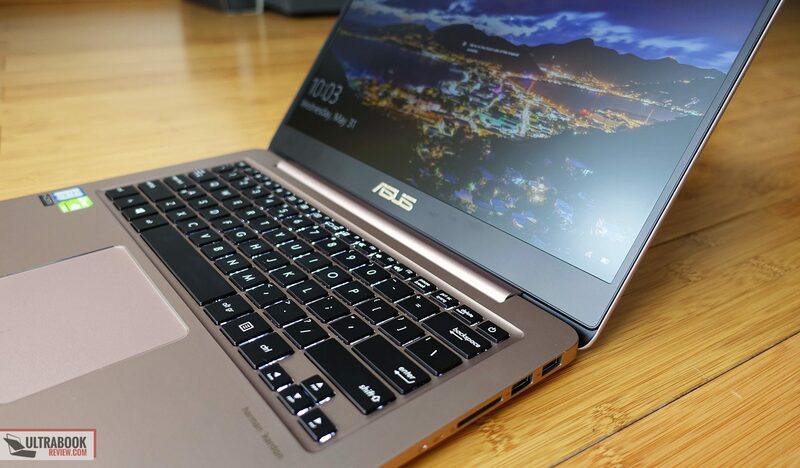 Summary: The Zenbook UX410 is one these modern ultraportables that squeeze a bigger screen inside a compact shell. 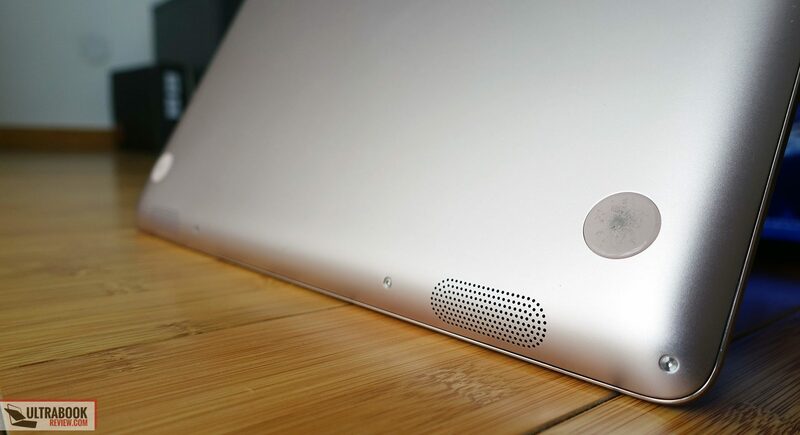 In this case, it's an excellent 14-inch matte display inside the body of a 13-inch notebook. 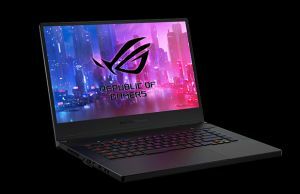 It's not as light or as thin as some other ultraportables out there, but it gets you a Core i7 processor and Nvidia graphics that perform flawlessly and keep cool even under load, lasts for a long time on a charge, offers good IO and upgradeable hardware. 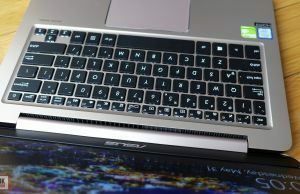 There are however a few nits and bits that spoil what could have otherwise been an excellent multimedia laptop, but you'll find more about these from the article below. 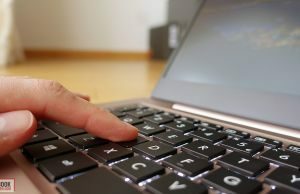 OEM’s focused much in creating thinner and lighter laptops in the last years, yet only few turned their attention on the overall footprint of their devices. 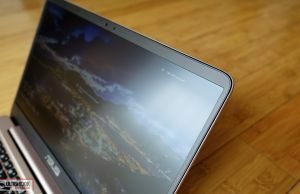 Dell was one of the first with the XPS 13 series launched back in 2015, which is still my ultraportable of choice today (Mid June 2017), but others followed more recently. 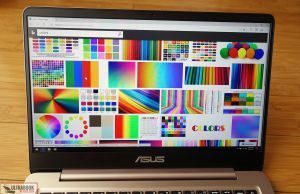 The Zenbook UX410 (or UX3410 as it’s known in some parts of Europe, but we’ll refer to it as the UX410 in this article) does that too, but in a slightly different way. Asus took their standard 13-inch Zenbook and put a 14-inch screen on it, just like they also did with the Zenbook UX430 and UX490 lines we already reviewed here on the site. 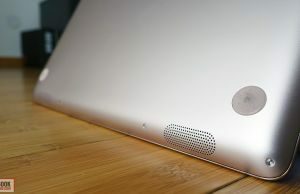 The end result is not a computer as thin or as light as the Dell XPS 13 (2.7 lbs, 0.6″) or the LG Gram 13 (2.1 lbs, 0.6″), which put 13-inch screens in small 12-inch bodies, but at 3.1 lbs and .75 of an inch thick, still a very good all-round portable laptop that actually offers a larger work area and a few extras, as well as sells for less than those aforementioned ultraportables. In fact, the UX410 and UX430 series have similar price tags, starting at around 900 EUR for the base models. 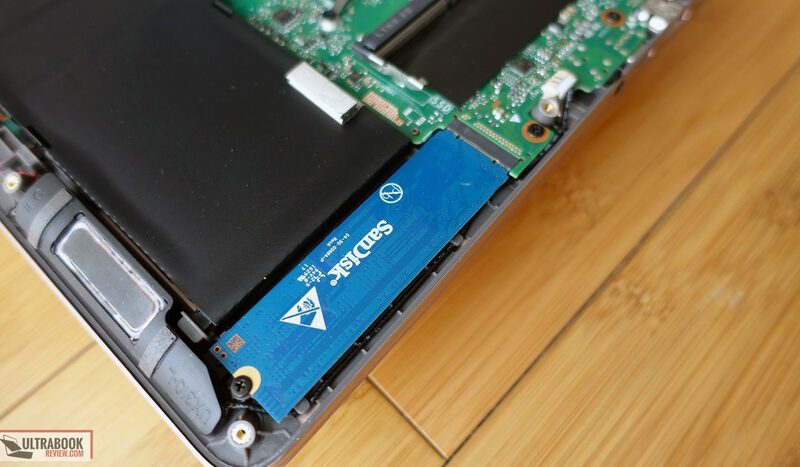 We have a more in-depth comparison between these lines here, but in very few words the UX430 is the lighter and slimmer option of the two, while the UX410 provides space for a 2.5″ storage drive on top of the M.2 SSD, gets upgradeable memory, a more complete set of ports and runs cooler. But how does the Zenbook UX410 actually feel in daily use, where it shines and where it could be improved? Well, you’ll find all these from the review below. 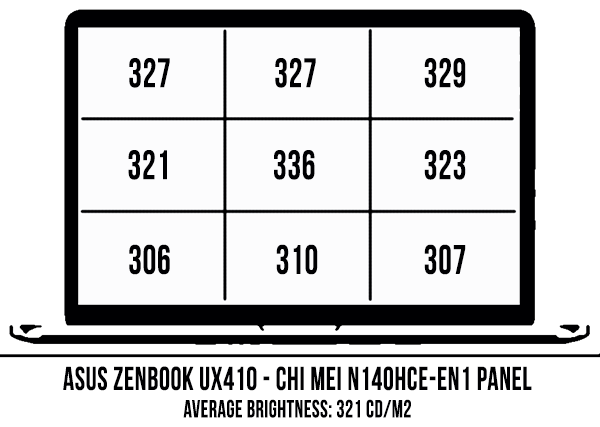 As with most Zenbooks, the UX410 is available in two main lines, each with a few different processors, RAM and storage options. Those are the UX410UQ, with Nvidia 940MX dedicated graphics, and the UX410UA, which rely solely on the Intel HD graphics integrated withing the Intel CPU. Both perform exactly the same in terms of daily use and battery life, but normally I’d recommend the UQ for those of you that might want to run games on their machine as well and the UA for everyone else. The price gap between them is usually very small (tens of dollars), and on top of that, Asus doesn’t always offer both the UA and the UQ configurations in a given country, so if the UQ is the only one available where you live just get that one, even if you don’t play games. The UAs can handle light gaming as well, but to a lesser extent. If you’ve seen a Zenbook released in the last 2-3 years then you’ll know how the UX410 feels and looks. 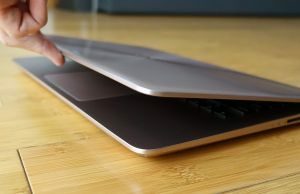 Like I mentioned in the beginning, on the outside it is very similar to the Zenbook UX310 and UX330 13-inchers that are still widely available, but this one gets a larger screen in the same body, and I don’t see why anyone wouldn’t want a larger screen in these conditions. In other words, the Zenbook UX410 gets an all-round aluminum exterior. 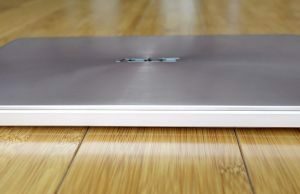 It’s not an unibody design like on the Macbooks and other premium tier devices, as its inner frame is made out of plastic, but the laptop still feels solid in use, with just little flex in the hood or in the chassis and keyboard area. So it’s not as tough as a Macbook, but not poorly built either. Asus offers this in two color options: Rose Gold and Quartz Gray, and the one we had for the review was the former. Both look professional in my opinion and both do a great job at hiding smudges and fingerprints. 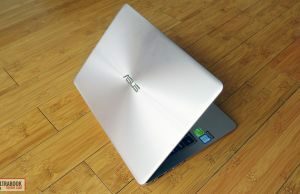 The lid is covered with a textured aluminum, the standard Zenbook design with ripples of concentric circles spreading from the chromed Asus logo in the middle. 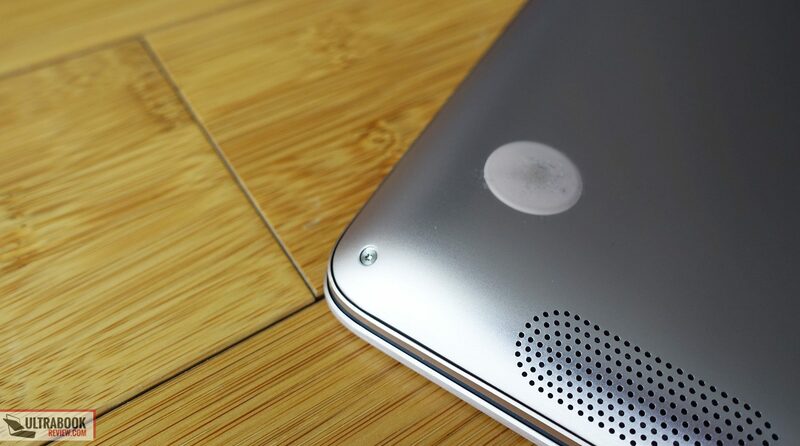 The interior, sides and underbelly on the other hand are made from simple, smooth aluminum that feels nice to the touch and should handle scratches well. The only plastic you’ll find is on the narrow bezel around the screen and on the hinge’s frame. Those sides bezels sure look cool. The top and bottom ones are just normal in size and not as small as on the XPS, but that allows Asus to put the camera and microphones on top of the panel, where they make most sense. 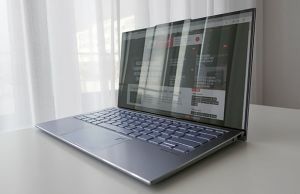 There’s not much to complain about the design and overall finishing quality of the Zenbook UX410, except for one aspect: the joint between the upper main-deck and the lower panel is not completely flush and leaves up some sharp edges, mostly around the front corners, which you’ll feel when you’ll grab the laptop. I noticed this on other Zenbooks as well, but varies from unit to unit, so it might be more pronounced or more subtle on your device, it’s just a matter of luck (and somewhat poor quality control). That aside though, the UX410 gets a low profile, spacious palm-rest, blunt edges and nicely rounded corners, so it’s overall nice to use. The laptop sits properly on a desk thanks to its grippy rubber feet and the screen can be lifted with one hand, although the hinge is a little firmer than I’d want and the bottom half lifts a bit from the table, but that also means it’s able to keep the screen in place the way you set it to. The display’s angle on the other hand is limited, it can only go back to about 120 degrees, which is just not enough for an ultraportable that’s supposed to be used in all sorts of conditions, including on the lap, in tight places or when lying down in bed. Flipping this upside down you’ll notice the rubber feet I mentioned earlier, as well as the speakers’ cuts towards the front. There are no air intake grills down here, which means you don’t have to worry about covering the bottom in use, yet it’s advisable you don’t completely block the air flow if you’re playing games. 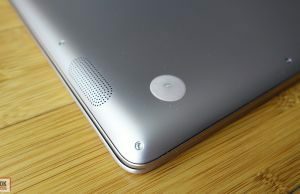 Ventilation happens through the cuts behind the hinge, as on most Zenbooks and other similar devices. Last we should also mention the ports. 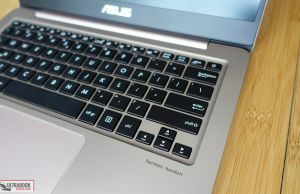 Given the UX410 is a bit thicker than other modern ultraportables, that allowed Asus to put full-size ports on its sides, which include 3 USB Type A ports, an USB Type C gen 1 port, HDMI video output, a card-reader and an audio jack. Most of them are placed on the left edge, including the PSU, which righties will appreciate when hooking up peripherals. As a side note, the USB Type C port does not support Thunderbolt 3, only one of the USB Type A slots supports USB 3.0 speeds and the card-reader is slow for this day and age, being hooked to the motherboard through and USB 2.0 internal connection as far as we can tell from our tests. 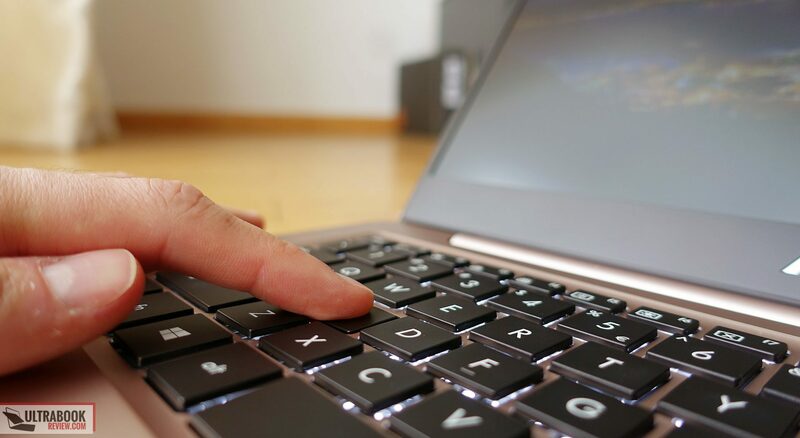 The keyboard on this laptop looks like the one on the Zenbook UX430 and UX330, but it actually feels different in daily use. I’m not sure if that’s because it’s a different internal design or just gets a different metallic back plate (keyboards have a metallic frame underneath, between the actual keys and the motherboard). 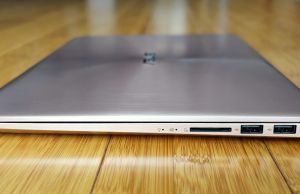 The layout is pretty standard though for a 13-14-inch Zenbook , with 15 x 14 mm rectangular keys, slightly smaller Function and arrow keys, as well as the Power button integrated in the top-right corner. Typing several thousands words on it left with me somewhat mixed feelings, after actually enjoying much the keyboard on the UX430. This one feels a little different, the keys have a slightly longer stroke (1.6 mm vs 1.4), increased resistance and poorer, spongier feedback. They failed to give me the comfort of knowing for sure a hit was registered unless I made sure I hit the keys in the center and harder, with the right amount of force. 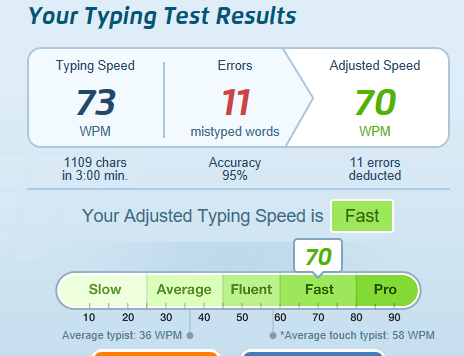 As a result I had to adapt my typing style, which resulted in decreased speed and some missed strokes here and there. Of course, you have to keep in mind that I type for a living and my expectations from a keyboard are higher than the average user’s, as well as subjective. This keyboard is definitely not bad and I feel most users will be happy with it. The keys are also backlit, with white LEDs and 3 levels of brightness to choose from, as well as fairly quiet. 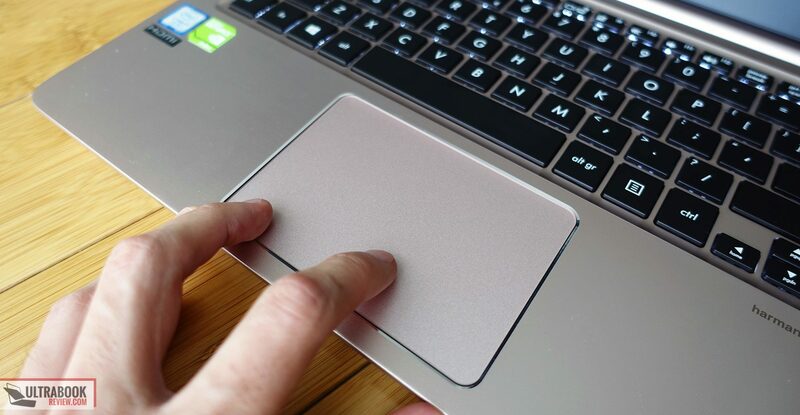 As far as the trackpad goes, it’s a plastic clickpad made by Elan with Microsoft Precision drivers, and it’s very similar to the one on the Zenbook UX310. In other words, it’s somewhat a hit and miss. 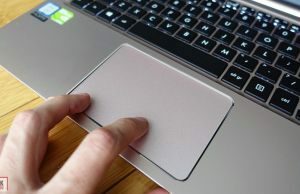 I had no issues with precision and accuracy during my tests with either swipes, taps and gestures, however, the cursor does have the “good” habit of erratically jumping, especially towards the lower right corner and when having a finger on the click area. This has been a long time issue with older Asus laptops, one caused by poor drivers, but also one that’s not easily reproduced. I haven’t’ ran into it on the newer models, but it looks like this laptop inherits one of the older trackpads that brings the jumpiness back. The Zenbook UX410 gets a 14.0 inch display with a matte FHD IPS panel. 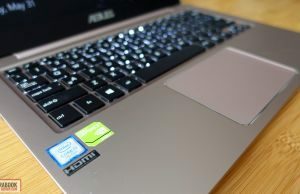 It’s a Chi Mei N140HCE-EN1 panel, the same as on the Zenbook UX430, and an excellent option for a mid-tier laptop both in terms of overall quality and as how well it matches the computer’s configuration. 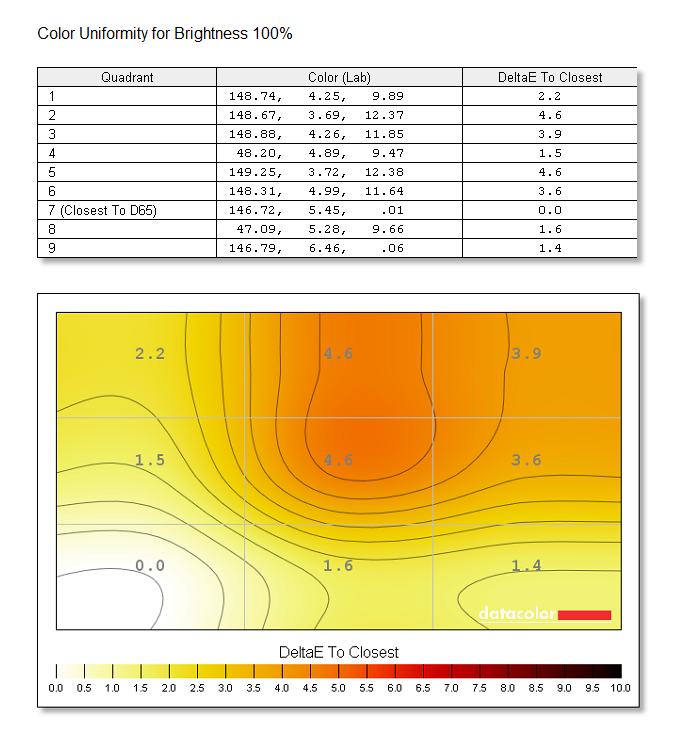 It’s a bright enough panel to allow you to take the computer outside or in well lit offices, it offers solid contrast, wide viewing angles and good colors out of the box, with the exception of an overall blue cast that can be fixed with the calibrated profile available here. 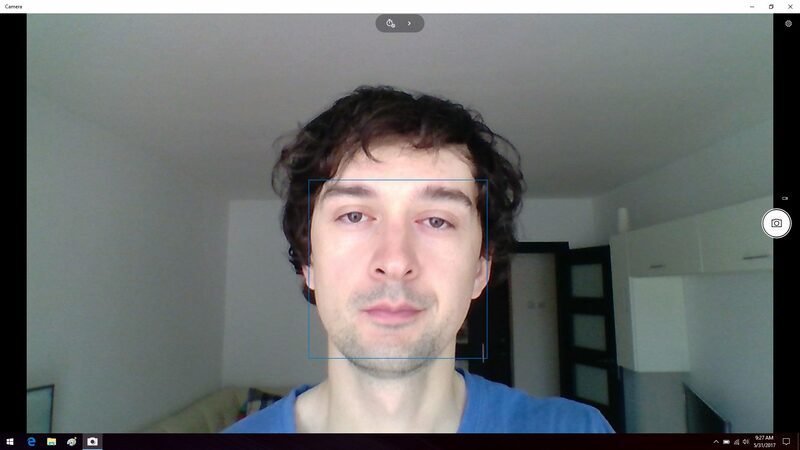 More details below, taken with the Spyder4 sensor. 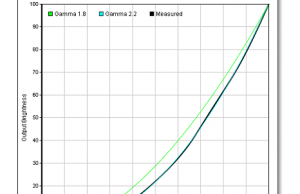 Average DeltaE: 0.69 uncalibrated, 0.68 calibrated. I noticed a few pinches of light bleeding around the bottom edge on our sample, but not enough to actually bother me in daily use. 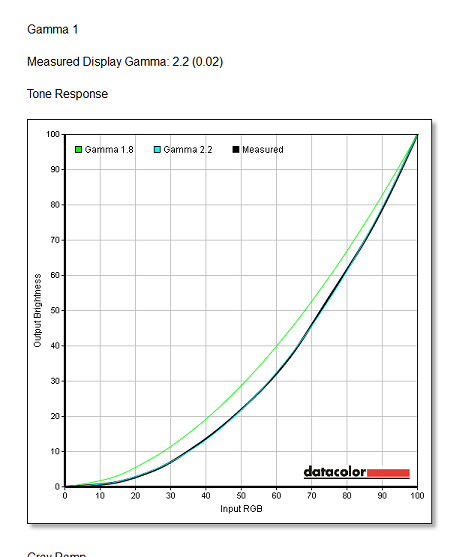 Light bleeding is common on matte screens in this segment, and the amount of it is again a matter of luck, some units get less, some get more. Bottom point, the UX410 gets a very good matte screen. Just keep in mind that it only goes back to about 120 degrees and make sure that’s not limiting for how you normally use your laptop. 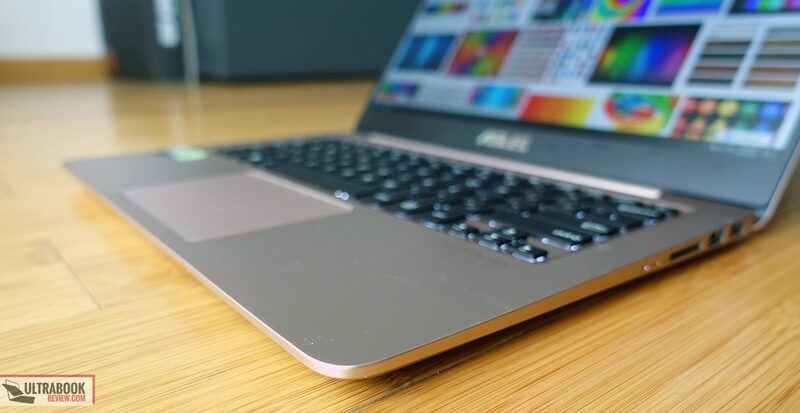 As a side note, Asus also puts a light sensor on this Zenbook which automatically adjusts the screen’s brightness based on the environmental light. I’d recommend disabling it (FN+A) and adjusting the brightness manually, it can get rather erratic and annoying in dim places. 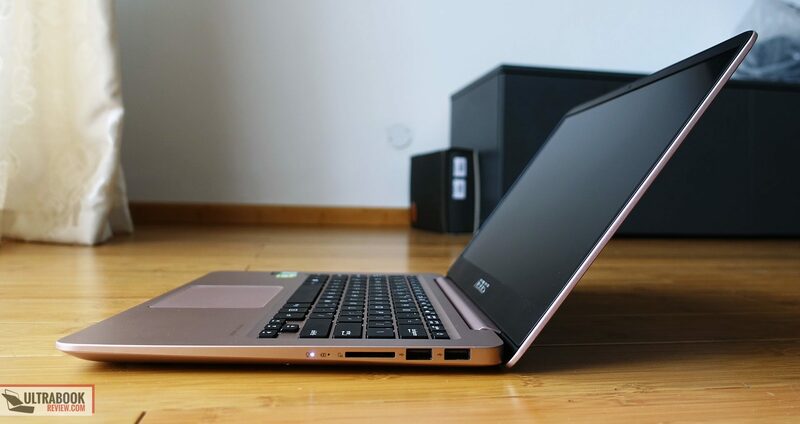 The Zenbook UX410 is available in a few different configurations and we tested a mid-range UQ version with a Core i7-7500U processor, Nvidia GTX 940MX graphics with 2 GB of GDDR3 memory, 8 GB of DDR4 RAM and dual storage, with an M.2 80 mm 128 GB SATA SSD and a 2.5″ 5400 rpm 1 TB HDD. A few things to keep in mind. The Core i7 processor is not a must for daily use, where the Core i5-7200U option will do just fine. 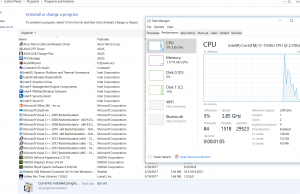 You’d benefit from the i7 if you plan to take advantage of its HyperThreading in serious multitasking or graphics and programming software, but not otherwise. Then, the RAM is upgradable, this computer comes with 8 GB of RAM preinstalled and soldered on the motherboard, and a spare RAM DIMM that can take an extra up-to 16 GB stick (for a total of up to 24 GB). Again, 8 GB should do for most tasks, but there’s always to option to add more. As far as storage goes, this unit comes with a SATA M.2 SSD out of the box, however the M.2 slot is hooked up to a PCIe x4 lane, which means you can replace the existing SSD with a faster PCIe drive. 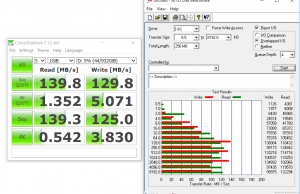 Those are however PCIe 2.0 lanes and not PCIe 3.0 lanes, which means you won’t get the full speeds of a modern NVMe drive like the Samsung 950/960 Pros, but only about 1800 read/1600 write speeds, according to this source and the comments on the UX430 review, which gets the exact same hardware platform. I haven’t tested this myself, but the vast majority of users shouldn’t have an issue with this aspect, which is almost impossible to notice in actual use. 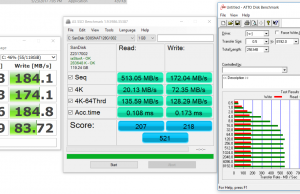 In fact, I believe the regular user will be more than satisfied with the included SATA drive as well, especially if coming from an older device without an SSD. The 2.5″ bay is standard and takes 7 mm 2.5″ drives. Ours came with a HDD, but you can replace it with an SSD as well if you want faster performance or in order to eliminate the noise of a spinning drive. 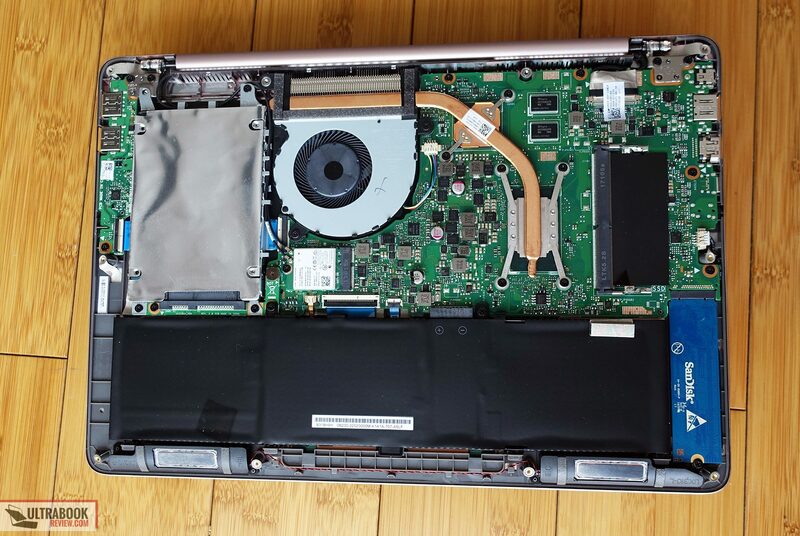 The RAM, storage, Wi-Fi chip and battery are all accessible if you remove the laptop’s entire back panel, which is hold by a handful of Torx T4 screws around the sides, and two more Philips screws hidden behind the rear rubber feet. Details in the pictures below. 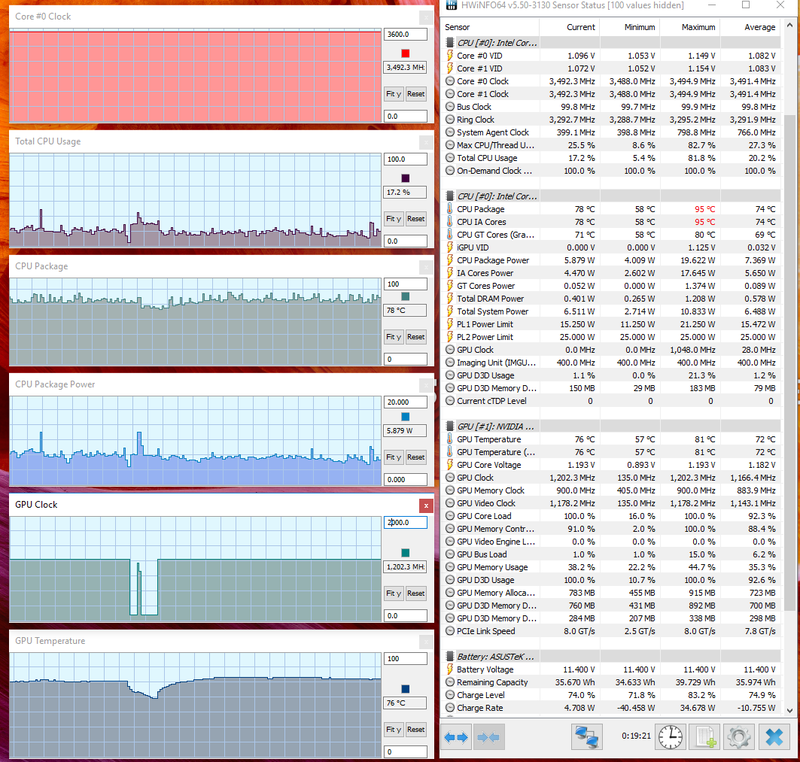 Performance wise, there’s nothing I can complain about here. 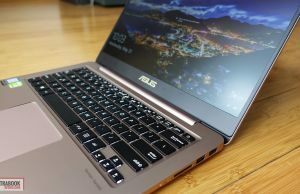 The reviewed Zenbook UX410 performed just as this configuration should, with no hiccups or sluggishness. 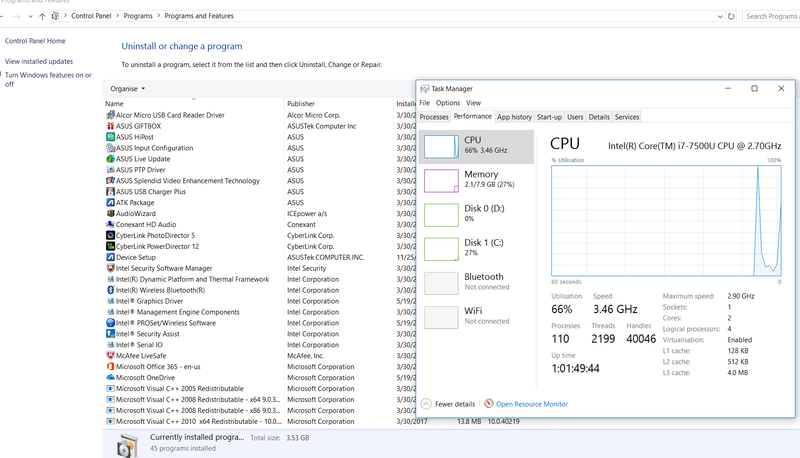 There’s a fair amount of bloatware preinstalled though and if I were planning on getting the most out of this machine I’d do a clean Windows reinstall. Didn’t do it on my unit, but did manually uninstall all the unwanted stuff. 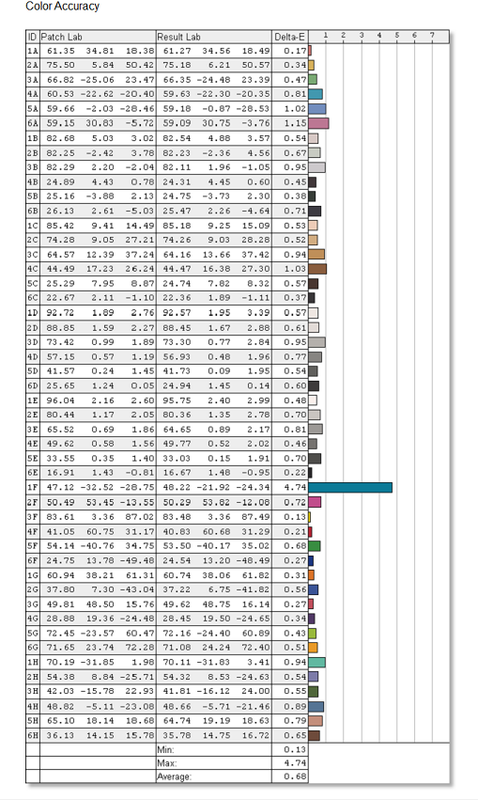 You’ll find some benchmark results below. We tested a retail model, so you should expect similar numbers from the units you’ll buy in stores. 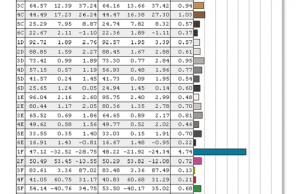 x264 HD Benchmark 4.0 32-bit: Pass 1 – 121.72 fps, Pass 2 – 22.96 fps. 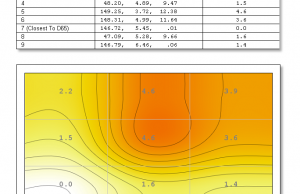 I’ve also added details on temperatures and performance in various standard scenarios. 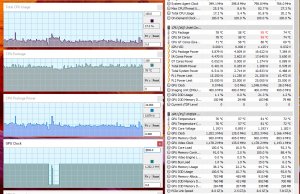 The components run flawlessly and a little cooler than on the UX430, especially in demanding loads. Even gaming performance on battery is top-notch, with no CPU or GPU throttling, which you’re not going to get on most ultraportables in this segment. As far as gaming goes, the Nvidia 940MX is an older entry-tier chip, so there’s not much it can do, especially in the more recent titles. 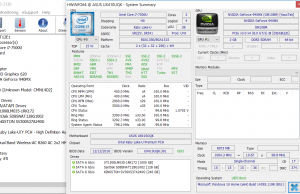 It is however a step-up from the integrated Intel HD chip you’ll find on the UX410UA models and should offer decent performance with older titles on FHD resolution and mid-level graphics settings. 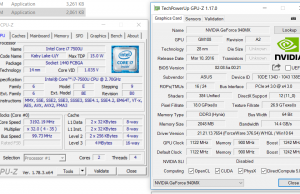 The Intel HD 620 numbers were recorded by disabling the Nvidia chip, in order to simulate what the UX410UA models are capable of. 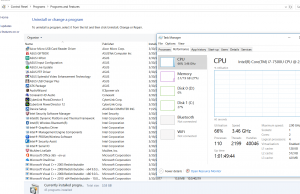 There’s a single fan on this laptop and it’s active all the time, even with very basic activities, although both the inner and outer case temperatures tell us that the hardware could be easily cooled passively with most daily tasks. The aggressive fan profile plagues pretty much all Zenbooks available these days and Asus did nothing to address it with a BIOS update. 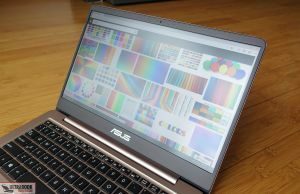 People on the forums and in the comments section of our various Zenbook reviews report a workaround, a small piece of software called NoteBookFanControl. This allows to set custom fan profiles based on CPU temperatures, for instance you can set the fan to stay idle as long as the CPU doesn’t get past 50 C, which should cover most casual use scenarios. Still, this is not something most buyers know of, so the smart thing for Asus to do is to make sure their default fan profiles are better adapted to the hardware available in 2017, or at least provide a preinstalled app that would allow users to control the fans, something similar to the Fan Xpert they offer for their motherboards. It puzzles me why either of these has happened by now, given the amount of complains and the fact that pretty much all competitors have smarter fan profiles. Now, in all fairness, the UX410 is not as noisy as then UX430 in daily use and the fan noise is covered by the speakers when having a song in the background or watching a movie. 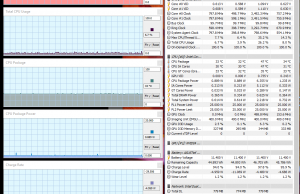 You’ll hear the fan in a quiet room though and you’ll also hear the HDD’s rumbling and some coil whining on top of that. The fan and the HDD can be addressed, but the electrical noise cannot. 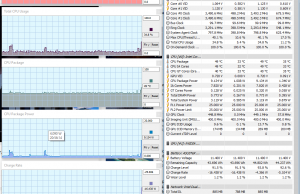 Under load, the fan spins faster and gets to about 42-43 dB at head-level, which is not bad, given you do get an i7 processor and dedicated Nvidia graphics inside after all. 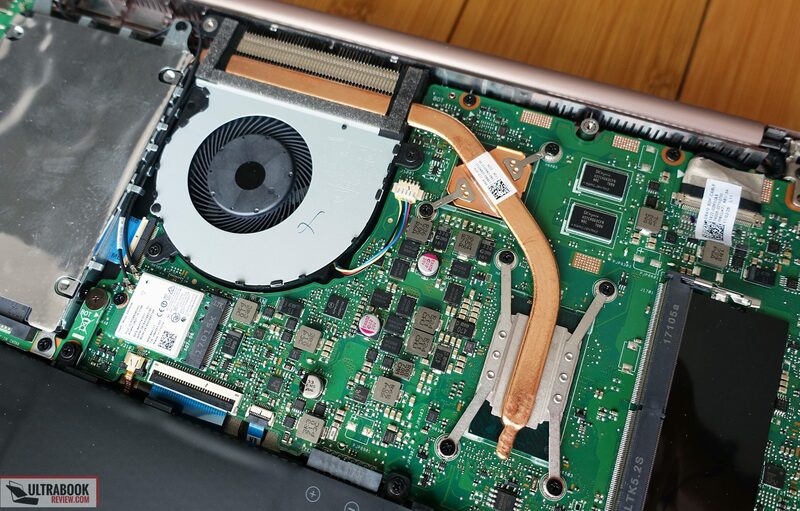 As far as temperatures go, both the internal components and the outer case remain cooler than on most 13 and 14-inch ultraportables of the moment, which actually leaves Asus plenty of room to tweak the fan’s behavior. It just shouldn’t spin with daily activities on a computer like this one. Check our the images below for more details, and keep in mind the UX410UA models will actually run even cooler under load. 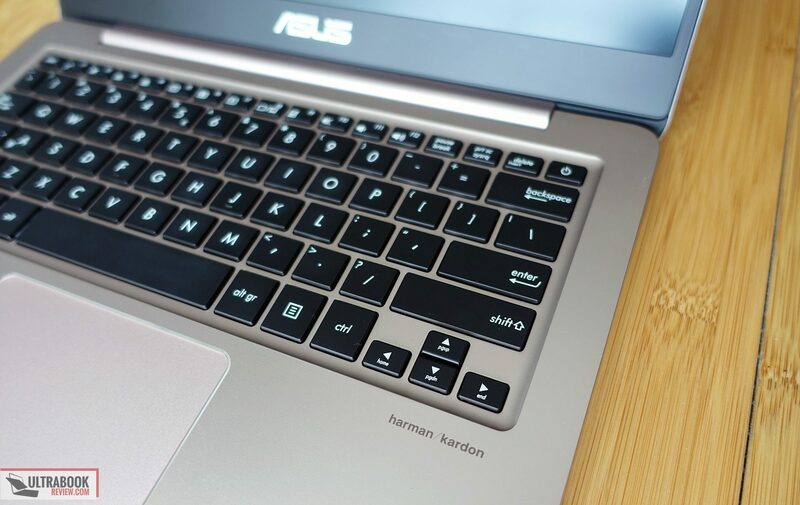 Connectivity wise there’s Wi-Fi AC and Bluetooth 4.1 on the Zenbook UX410. Our unit came with an Intel 8260 AC wireless module, whose performance proved rather lacking though. This laptop could not match my otherwise poor Internet speed (100 Mbps) near the router and download speeds at 30 feet and 2 walls in between dropped to levels that made browsing and watching movies sluggish. I haven’t seen complains about the wireless performance in the few other reviews available online, nor on the forums (albeit that’s not relevant, since the UX410 is not widely available), so I reckon this was an isolated drivers issue on my unit. Zenbooks have been plagued by unreliable Wireless drivers in the past, so you should extensively check the Wi-Fi performance of your unit if you get one. 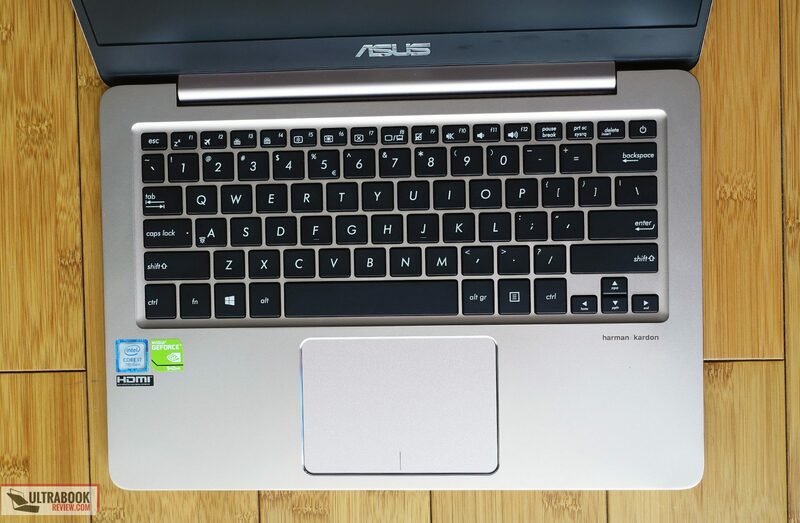 Asus chose to use stereo speakers for this laptop and placed them on the underbelly, towards the front, like on the Zenbook UX330. I was afraid they would be easily muffled when using the laptop on the lap, but that’s not the case, covering the cuts has only a small impact on the sound quality and volume. The volume is not very loud anyway, we only measured up to around 76 dB at head-level with our test songs. The overall audio quality is not bad though. I’ve mostly used the Music setting in the include Audio Wizard App, but you can also tweak the output in you want to. I haven’t noticed any distortions at high levels and no obvious vibrations in the palm-rest either. So overall these speakers should do fine for the normal consumer. 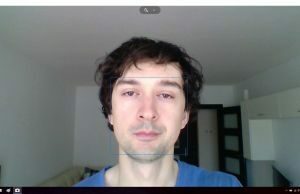 The webcam at the top of the screen on the other hand is mediocre, even in good lightning, as you can see above. 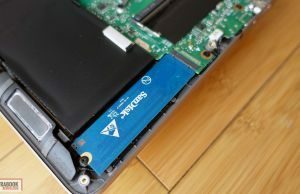 There’s a 48 Wh battery inside the Zenbook UX410UQ, rather small for a laptop of this size, but otherwise also fairly standard for the mid-range price class. You’re not going to get much in terms of gaming, given how the CPU and GPU run at full blast on battery, but otherwise the UX410 does alright. The UQ models, like the one tested here, do come with Nvidia Optimus, which means the Intel graphics chip is used most of the time and the Nvidia chip remains disabled until required. Check out the numbers below for more details (the screen’s brightness was set at 30%, ~120 nits). 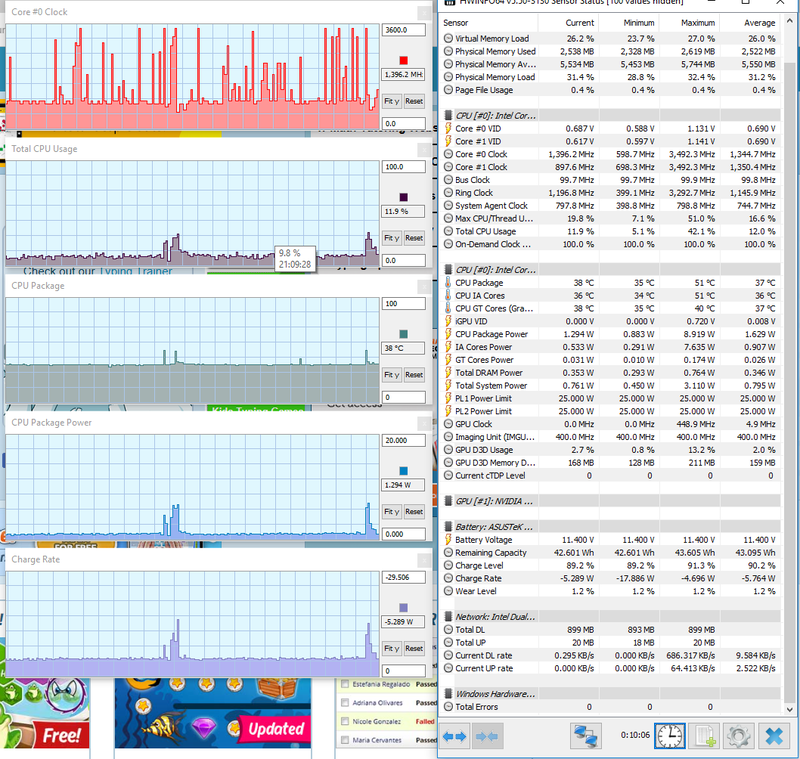 33.0 W (~1 h 25 min of use) – gaming, High Performance Mode, screen at 30%, Wi-Fi ON. The laptop comes with a 65 Wh charger and a full-recharge takes around 2 hours and 15 minutes. The wall plug is integrated withing the power brick, with non-retractable prongs, like on most other modern Zenbooks. 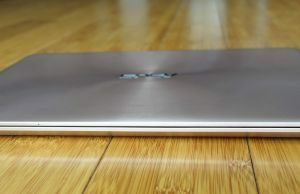 The Zenbook UX410 series is not available in the US or Canada at the time of this post, but can be found in most of Europe and some regions of Asia, albeit in some countries like Germany it’s listed as the Zenbook UX3410. I can’t tell when or if this will be available in North America, I suggest contacting Asus on Twitter or Facebook and see what they have to say about it, I don’t have any insiders. I will however update this section if the status changes. In the meantime, if you’re living in Germany, you can find more about the available configurations and updated prices via this link. Prices range between 900 and 1200 EUR at the time of the article, so I expect a base Core i5 model to start at around $800-$900 in the US, when or if it will be available there. 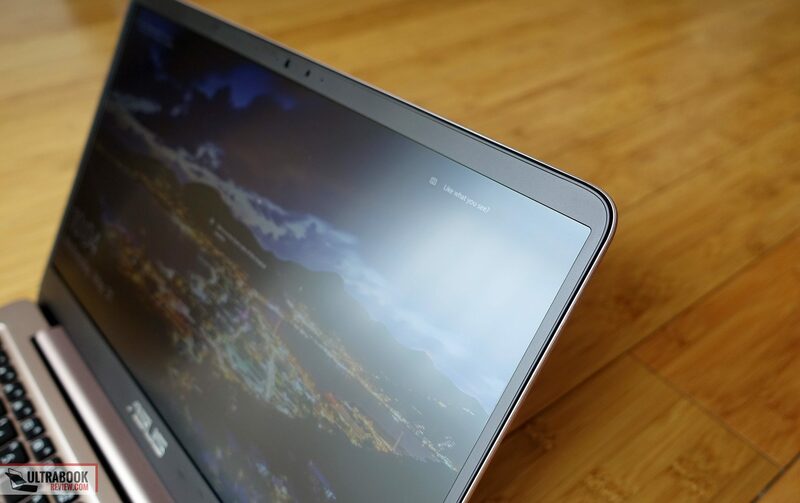 If you’ve read some of my other articles you probably know I’ve been using the Dell XPS 13 for a while now and one of the main reasons for that was its form factor. I’m more than willing to pay extra to get a bigger screen into a smaller laptop, and I believe I’m not the only one. 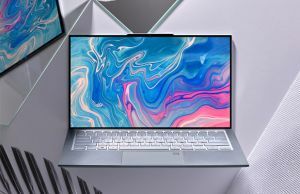 With the Zenbook UX410, just like with the Zenbook UX430 and a few other options out there, you get a notebook that’s about the same size and weight as a Macbook Air, but gets a 14-inch display. There are more portable options available in stores these days, but few sell for under $1000 once you start specking them up to a decent configuration. 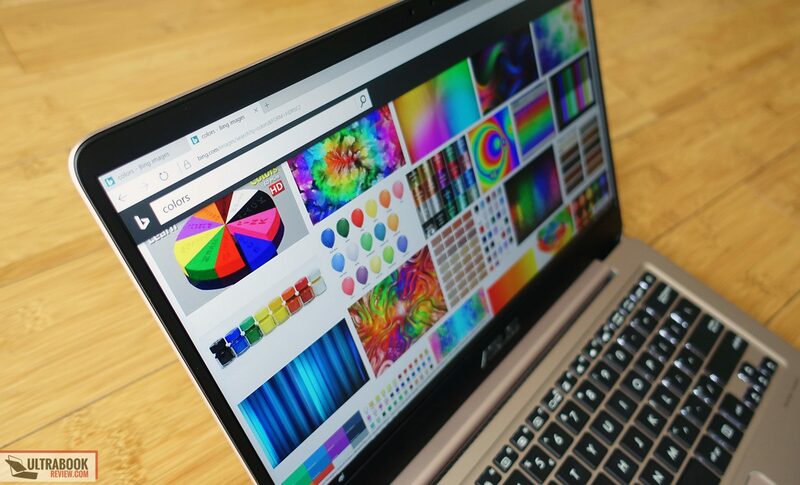 And this laptop doesn’t just get you the hardware that runs at full blast and low temperatures, it also includes a very good IPS display, a decent keyboard, proper IO and can squeeze much of its otherwise average sized battery. In other words, the Zenbook UX410 is one of the better ultraportables you can get for around $1000/EUR 1000 these days. Well, at least in the few countries where this is available. On the other hand, there are a few crippling flaws you need to be aware of, and most of them are a matter or substandard design or quality control if you ask me. On the outside, there’s the screen that only leans back to about 120 degrees and the underbelly and main deck that don’t attach smoothly and leave up sharp bits, while on the inside there’s the overly aggressive fan profile, the jumpy trackpad and potentially problematic wireless performance at longer ranges. These latter three could all be fixed by software software updates, if Asus actually cared enough to read the reviews and forums. So to wrap this up, if this laptop offers what you want, if it’s available in your country and if you can get it from a reputable place that would allow easy returns in case you have the luck of ending up with a faulty unit, I’d say go ahead and get one. 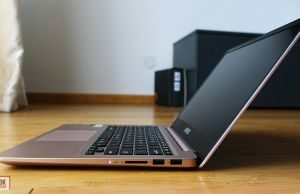 Otherwise, you could also consider devices like the Zenbook UX430 series (read our detailed comparison between the UX410 and UX430 lines here), the Asus Pro B9440, Acer Swift 3 (and the updated Swift 3 SF-314-52) or the Lenovo IdeaPad 320s, as well as the Lenovo IdeaPad 710S, Dell XPS 13 and LG Gram 13 (this one is not available in Europe) if you can get at and slightly above the $1000 mark. 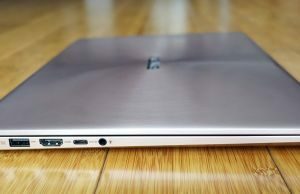 That’s about all I have to share about the Zenbook UX410, but the comment section awaits your input and questions below, so don’t hesitate to get in touch. Hi Andrei, I'm considering getting the UX410 with an i5 for £799 from AO.com, as an upgrade from my UX305 with an M3 processor (which is hard to buy nowadays, but used to retail at £550). 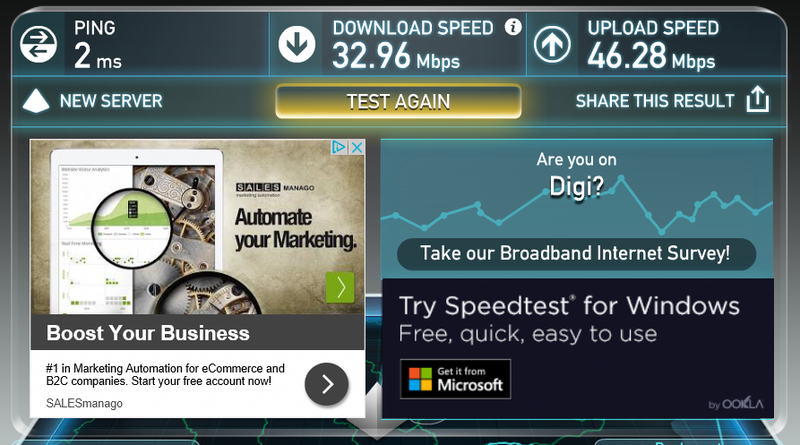 I've assumed the UX410 is 'better', along with assuming the i5 is better than the M3. However I'm not sure it's £250 better – the UX305 is practically silent compared to the always-on fan of the UX410, and the M processor has some advantages over the i. 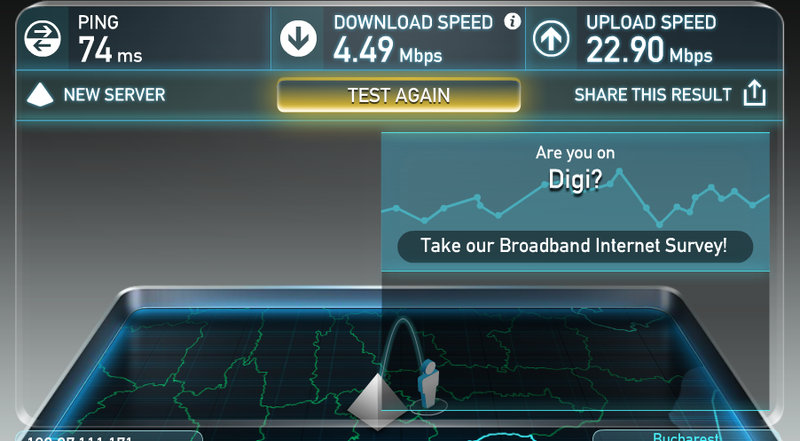 Can I be confident that the UX410 is really an upgrade, or is the difference not worth £250? 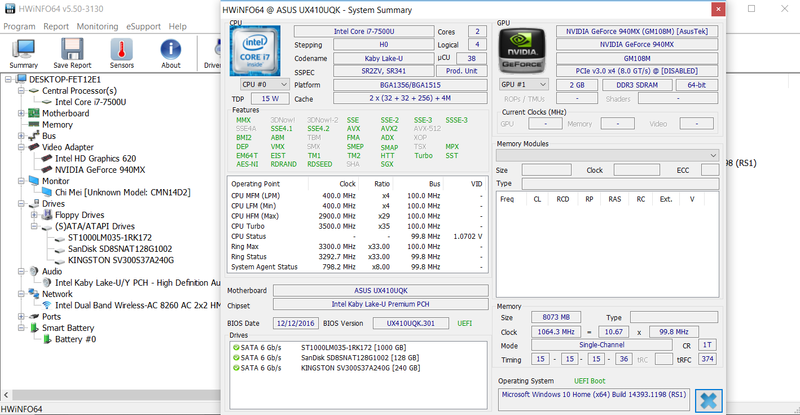 Hy, performance wise the UX410 is better. It also gets a larger screen, more ports, upgradeable RAM and storage and a slightly better keyboard imo. On the other hand, the UX410 is noisier (CPU with fan, that can be addressed with that small piece of software mentioned in the post) and heavier, so if you ask me you shouldn't upgrade unless the M3 UX305 is no longer powerful enough to do what you require it to do. Hi Andrei, I'm considering getting this (UX410UQ) or the UX430UQ. What would you recommend for an incoming freshman law student? Is the fan really that bothersome? The fan is active all the time and fairly noisy, but there's a fix that can block it till the CPU reaches a certain temperature. It's mentioned in the article, but not official, so you can use it on your own risk (although I'm not aware of any). Andrei, can you please tell me how annoying fan noise on this laptop truly is? Is it just audible or is it like something that is just too much and does not occur on most of the other laptops? I have the UX410UQ and added an 128GB PM961. In AS SSD I get 1390 MB/s read and 740 MB/s write. 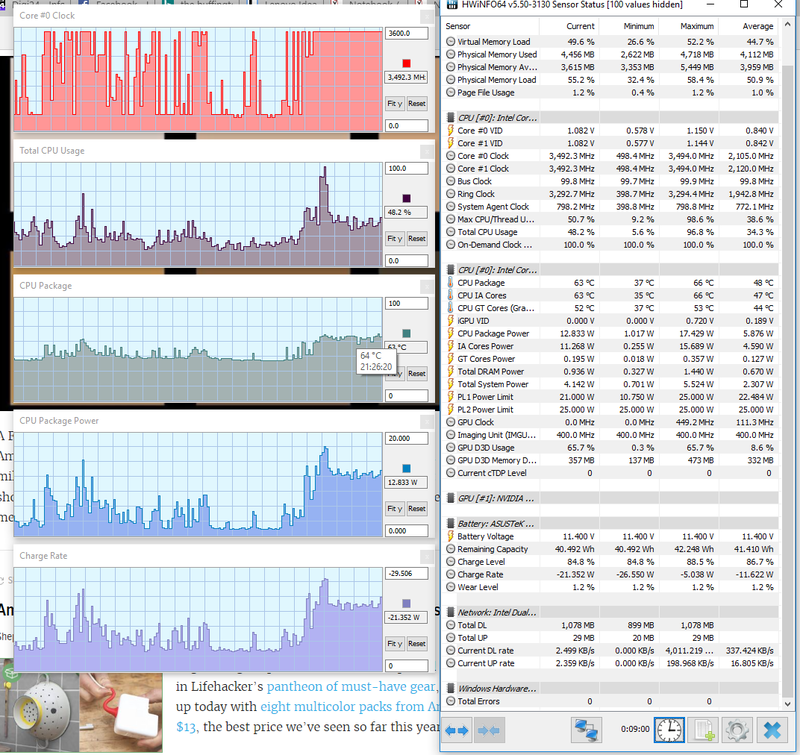 In Crystal it is 1820 MB/s read and 790 MB/s write. All drivers are newest available. I tested with older drivers (esp. VMMe) but always with worse results. Is the 128GB really so slow? Did you guys with 1850/1650 MB/s install anything special?? BTW if anybody is unsure if he should buy the UX410: I would never buy it again but I can't return it. 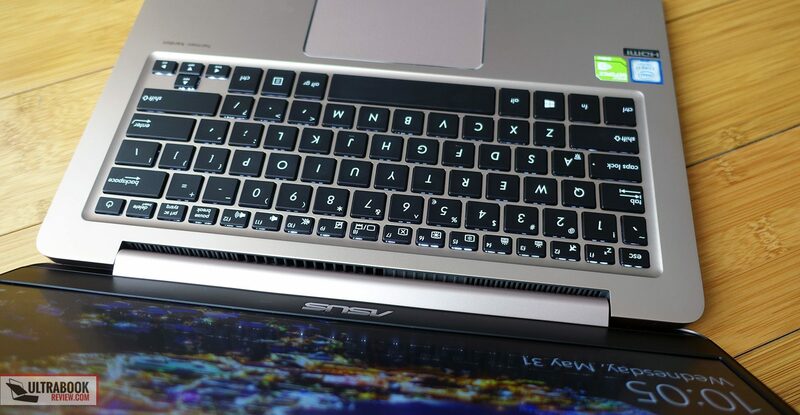 The keyboard is flexible crap, the click touchpad is plastic crap and sooo annoying, only the top is aluminum, everything else cheap plastic. No thanks. Go for Dell if you can. 1. 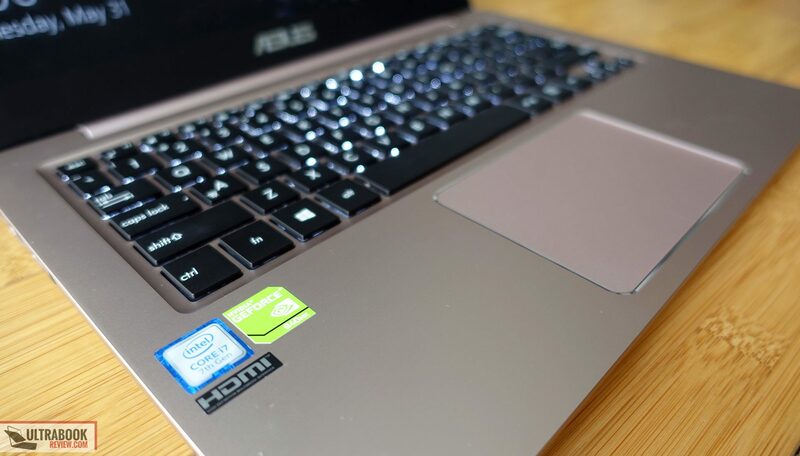 If you'll look through he comments on the UX430 review here on the site you'll notice the m.2 slot is hooked to PCIe 2.0 lanes, so an NVMe slot won't run at full speed on this laptop. I can't tell for sure what are the limits though, you'll need to dig further. But, do you really tell the difference in daily use? If so, in what kind of application? If you're using a 128 GB SSD I'd reckon it's just for OS and software, and personally I really doubt you can tell the difference between 1.8 and 2.5+ Gbs reads. I for one can't, at least. PS: Is there a Dell alternative for this laptop? Which one? I agree, in daily use I probably wouldn't recognize any difference. 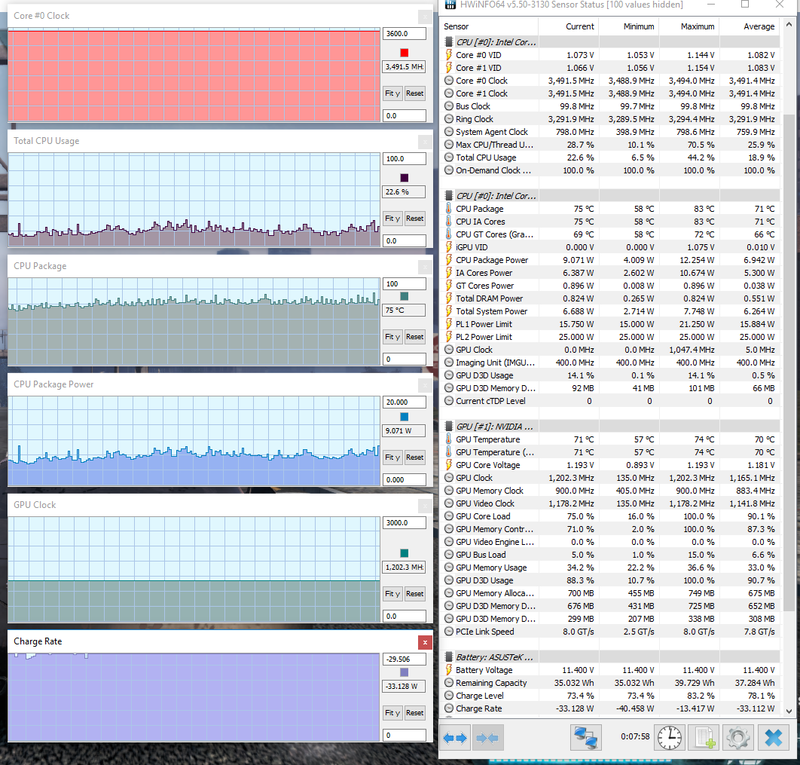 Only when copying large files or many small files, because my PM961 also has a bad 4k speed of 45 / 130 MB/s. 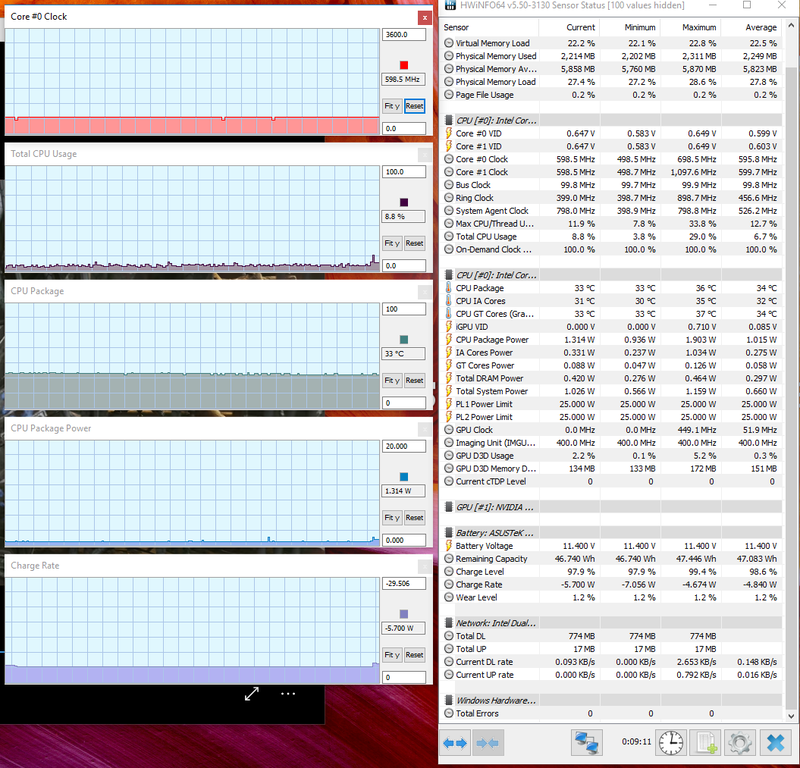 Generally a 256GB PM961 in other laptops performs twice as fast and this is maybe a difference one can recognize. 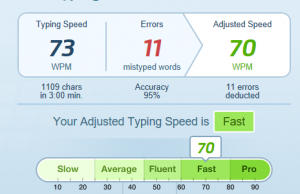 I just wondered why my write speed is only 750 instead of 1600 as most of the owners in the ux430uq comments mentioned. I wonder if they used Samsungs newest NVMe drivers as I did. 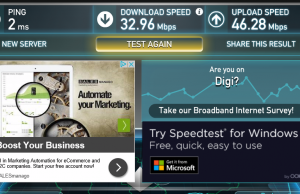 Unfortunately I can't help with the speeds, i no longer have the laptop around and never tried adding a faster drive on my sample in the first time, perhaps others can pitch in. 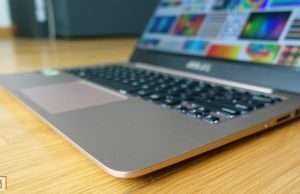 You could also drop a comment in here: https://www.ultrabookreview.com/14425-asus-zenbook-ux430-review/ , there are more people following that post and some of them upgraded the storage. On the other topic, yes, it's true the XPS and those Latitudes are nicer laptops, but I don't think it's fair comparing a new product to refurbished ones. Yes, you can get good value with refurbs and it's an option to consider, but I'd reckon most regular buyers would be more comfortable buying a new product. And as a new product, this Zenbook is a pretty solid option for the price imo. 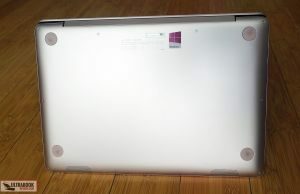 One more word to the laptop: A thing about the UX410UQ that really made me mad is the fact that everything is made of cheap plastic except the screen cover. 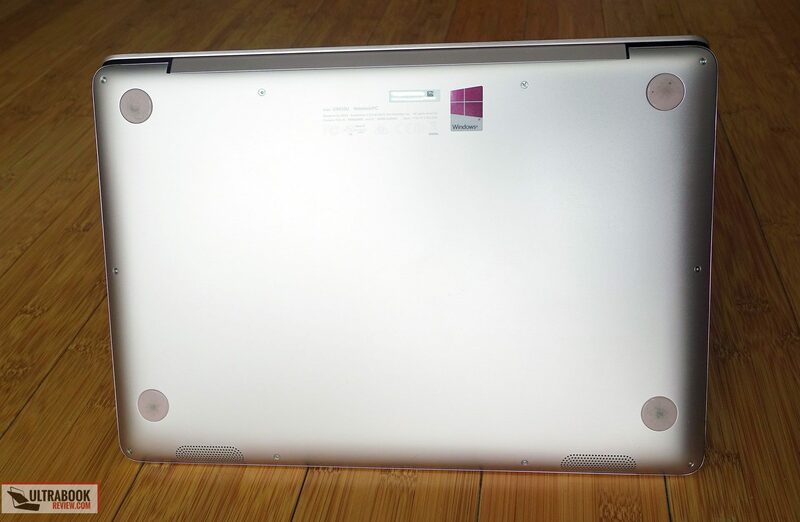 The former Zenbooks where made of an aluminum unibody. But almost none of the review sites I read mentioned that fact. 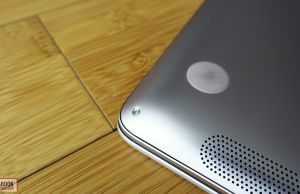 They always hyped the nicely cover of brushed aluminum. So I thought the whole laptop is made of aluminum parts. Unfortunately I bought it here in South East Asia and cannot return it. I'd wish that review sites more clearly describe the material of a laptop. Well, I will try to find out if there are different models of the UX410UQ. 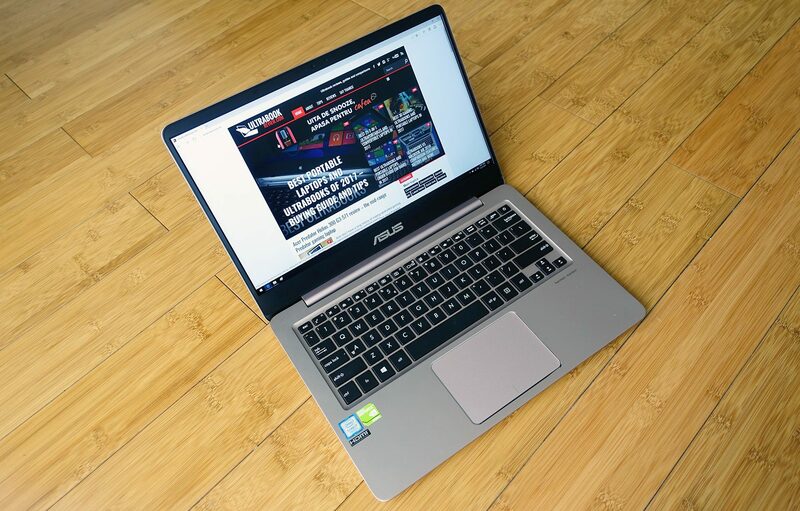 The Vietnamese Asus website lists prices of USD700 for the 410UQ (with i5, 4GB and HDD) and USD900 for the 430UA (with i5, 8GB and 256GB SSD). What where the prices in US? They're not available in the US, but over here in Europe their a little under 1000 EUR for the i7 configuration with 8 GB RAM and 256 GB SSD. The Ux410 is a little cheaper than the 430. Hi, If i wanted to play some games such as dota 2 and fifa on this laptop would it be able to run? In the review it was mentioned in the battery section that you wouldn't get much from gaming but it is unclear to me if it is just in regards to the battery. It's in regards to battery. 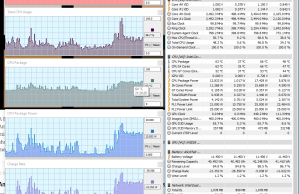 Gaming performance is explained in the Hardware and Performance section. Such games should run fine on the 940MX chip, although you might have to trim down graphics settings in the latest Fifa releases. Thanks for great detailed reviews. Today I've picked-up UX410UA-16 (16GB RAM) from shop. Wanted to add that SD card reader doesn't allow to insert adapter to the whole length! It's allow to insert only 1/3 of it's length. As I understand this is because of overall laptop height. Perhaps I should have mentioned this in the review, but that's the case with pretty much all Zenbooks and in fact most other portable laptops out there. A couple of new notes. I set Fedora26 OS in parallel to Windows 10 and was working mainly from it. Restart, plugging AC on/off didn't help. ACPI drivers removal/automatic install from Windows didn't help as well. I was able to ressurect charging only after reseting BIOS to defaults (I actually didn't change in it nothing) and temporary turning PC off. After that under Windows it started to charge again. And under Fedora as well. If you will google it you will find that it's quite common problem – battery stops to charge under Linux for some reasons (mainly acpi driver error). Handling is unclear and relates to kernel settings. Maintainers of OS usually say it's manufactury problem. Bad thing that on my previous Asus Eee PC1011CX weak _old_ battery died for the same reason. It discharged to 0% under Ubuntu and I wasn't able to charge it anymore from both Windows 7 and Ubuntu. 2. This one is a quite strange, but. 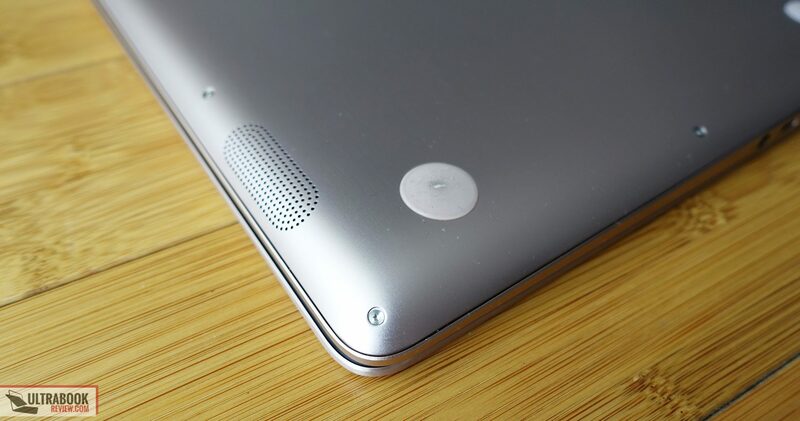 Because of metallic top surface, releif touch pad border reflects light in a quite strong manner. And you get sunbeams into your eyes quite often. "As usually advised for a new batteries"
It is usually NOT advised to do this with Li-Ion batteries. 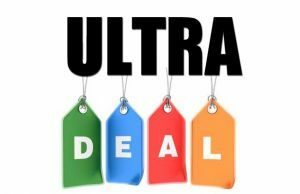 Just ordered my second UX410UA. Ordered one for my stepson and loved it, now my girlfriend needed one and I ordered another one. For the price, these things are just fantastic. I'm waiting on something 15" like UX530 upgrade to i7-8550U and MX150 myself. If that ever happens. Yeah, that potential ux530UN would be really nice. I would wish it got a bigger battery though, 52 Wh is not enough for me. do you have any idea what is the highest resolution monitor this notebook can drive via the HDMI output? Should drive 4K 30 Hz, not sure about 4K 60 Hz though. 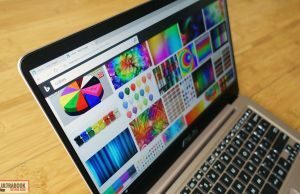 I'm a retired Yank residing in Thailand and your thorough review aided my decision to buy a Zenbook UX410UQ-GV052T. 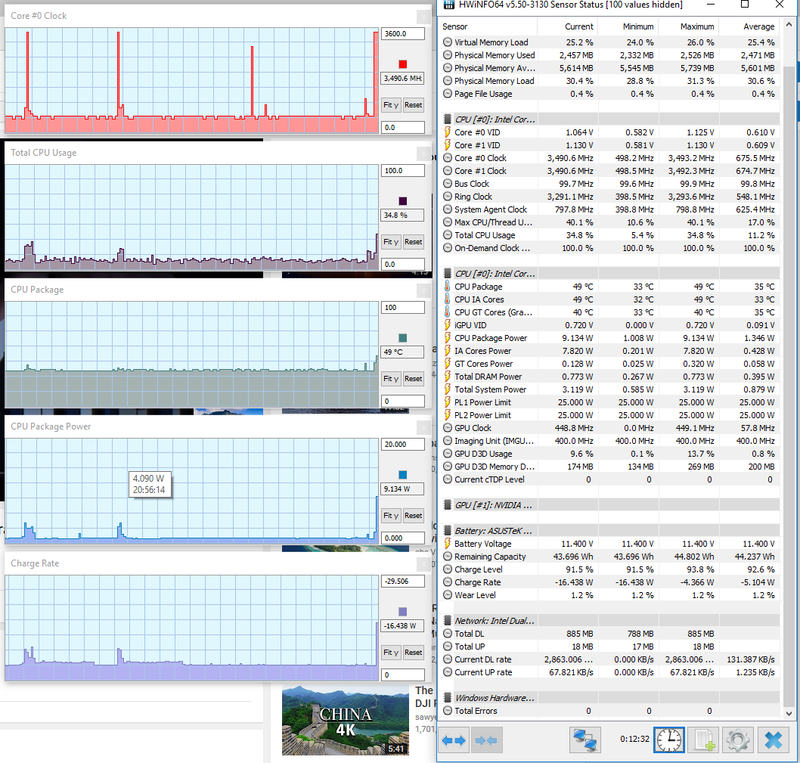 I added a 250ssd and more RAM to the laptop, which replaces my old Win-7 laptop which died. The new unit will be carried on my motorcycle trips exploring much of SE-Asia. 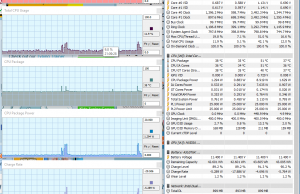 -I downloaded the ASUS UX410UQ color profile…but can't find a file or link to load the .umi file onto the laptop? 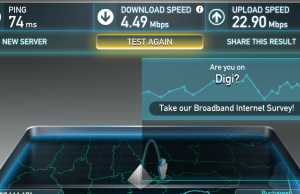 -Is there a way and how, when I am home, can I connect my modem to the unit? Is there an adapter for the modem plug used on my old Win-7 system and which port to use on the Zenbook? 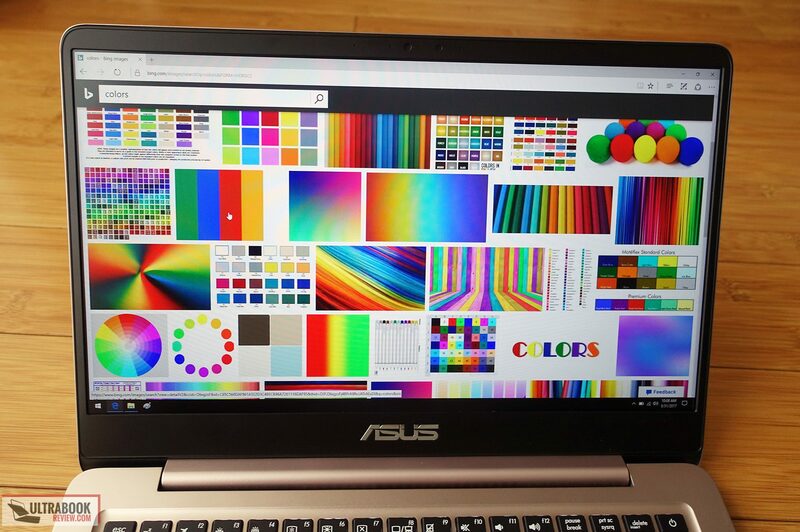 -Lastly, I can't located the 'Splendid' 4 available color file options on my Zenbook? Thank you for time and the vdetailed review. 2. What kind of modem? Does it plug via USB? If yes, an USB-C to USB-A adapter should work. Or you can buy an adapter with multiple ports, there are plenty on amazon and ebay. 3. Not sure what you mean here. If you're talking about the Splendid Asus app, I don't use it and I prefer to uninstall it anyway, then load the calibrated color profile manually. Hope these help. Please get back with clarifications if not. OOPS! Just discovered the ASUS adapter to connect my modem to the Zenbook. Ah, OK, already replied to this question, but totally forgot there's an adapter included already. Hello there! Thank you for the very detailed review. 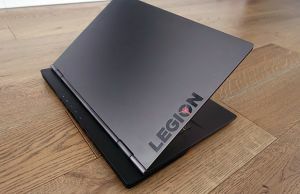 After the hinges on my Lenovo Ideapad U410 pretty much snapped and broke in half after almost 5yrs of use, it's time to look for a new portable friend. The UX410UQ is on sale these days for under 899 for the i5 model. 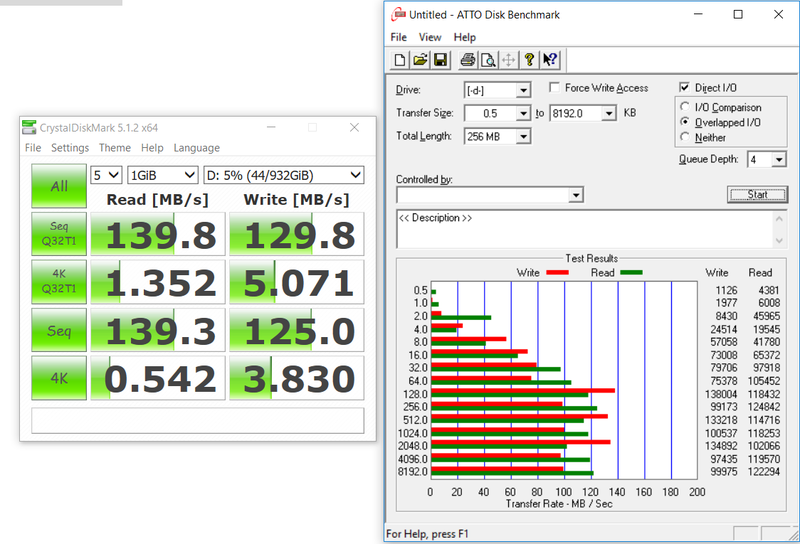 However, the same model also runs a 512GB SSD rather than the hybrid version in your review. Any thoughts on that? I'm quite enamored with the design and weight of the 410 after lugging around a much heavier laptop with the same screen size. Portability is key but unfortunately the 430s are too pricey for me. 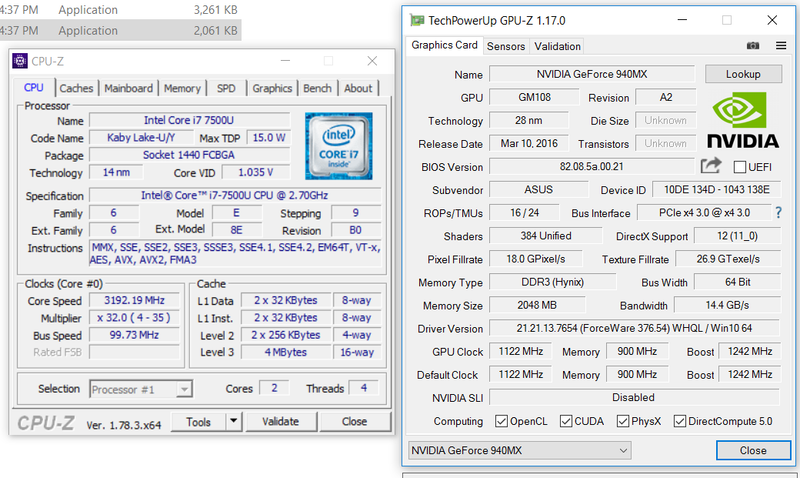 Either way, I just want to make sure I'm not making a mistake by going for the 410 model with only an SSD. Thanks! 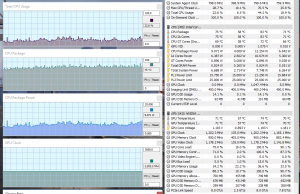 That's even better, the SSD is faster and it makes no noise, unlike a HDD. I would like about noise coming from inside laptop asus ux410uq ? I think you called that "some coil whining on top". 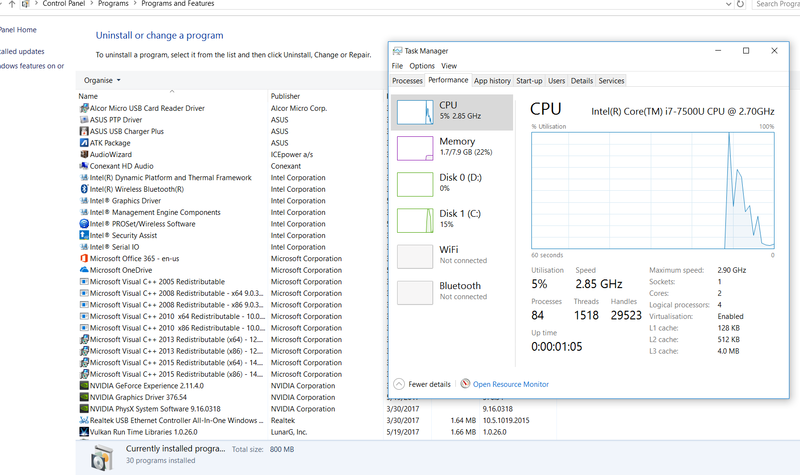 I started hearing some strange noise 2 days ago, like hard drive SSD working wrong or some "clicking" coming from inside laptop. I am wondering it is normal or I must be affraid, I am pretty sure that I didnt hear this few weeks ago. Does it come from the HDD? Put you ear on top fo the keyboard and try to narrow down the source. Coil whining does sound a little like a HDD spinning, but it should come from the CPU/GPU area, not the HDD. I wouldn't worry about it though if it's coil whine, aside from the inconvenience of having another noise source.